In a sight which will no doubt delight Liverpool supporters, Luis Suarez gave Sergio Ramos a torrid time as Barcelona thrashed Real Madrid 5-1 in El Clasico on Sunday. In first El Clasico since 2007 to feature neither Cristiano Ronaldo nor Lionel Messi, Real went into the fixture with manager Julen Lopetegui under intense scrutiny. Los Blancos sit ninth in La Liga after a miserable start to the season and such a heavy defeat is likely to see the former Spain manager dismissed from the Bernabeu. 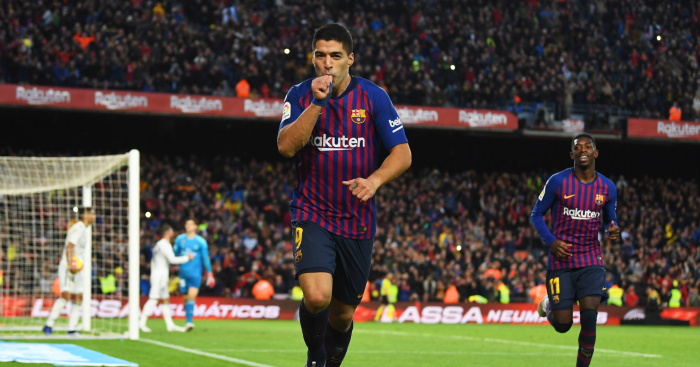 Suarez was the man to pile on the misery on Real and Lopetegui, bagging a hat-trick after Philippe Coutinho had open the scoring, while Arturo Vidal added a fifth. Marcelo had given the visitors hope by reducing the scoreline to 2-1, but Barca punished their fierce rivals with a late flurry. Former Liverpool hero Suarez completed his hat-trick after a mistake from Ramos, who is an unpopular figure on the red half of Merseyside after injuring Mohamed Salah in the Champions League final. Just sit back and enjoy this one, Reds.